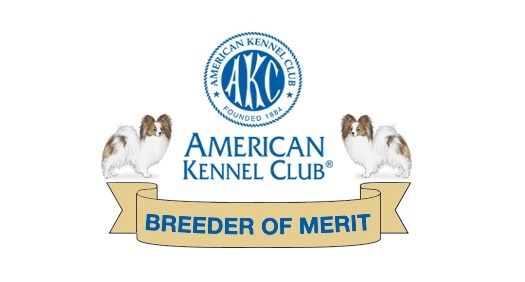 American Champion Clearlake Trip Wire,"Pretty" and litter mate American Champion Clearlake Trip to the Moon, "Alice"
Club Affiliations - I've served on the board of directors or been an officer in the following clubs: Papillon Club of America, Anatolian Shepherd Dog Club of America, Houston Kennel Club, Houston Area Papillon Club (current president). I am also a member in good standing of the Houston Area Toy Club. I am lucky. I grew up in a family showing and loving dogs. I breed and show Papillons with my mother Sharon Newcomb. 2009 Elyse Vandermolen with mom, AKC judge, Sharon Newcomb, with the Best of Breed rosette at the Westminster Kennel Club Dog Show, N.Y.
2008 A Family Portrait at Westminster Kennel Club Dog Show, New York. Elyse shown with American/Canadian Champion Coppermist Ice Dancer and two young sons - "John Smith" and "Zinger"
2006 American Champion Clearlake One More Time, "Toby"
I've had Anatolian Shepherds since the mid eighties. I always keep one around to watch over our Papillons. 1968 Elyse winning Juniors with a Whippet.